The burp cloth is made from a 6-ply name brand cloth diaper and measures 13" x 19". 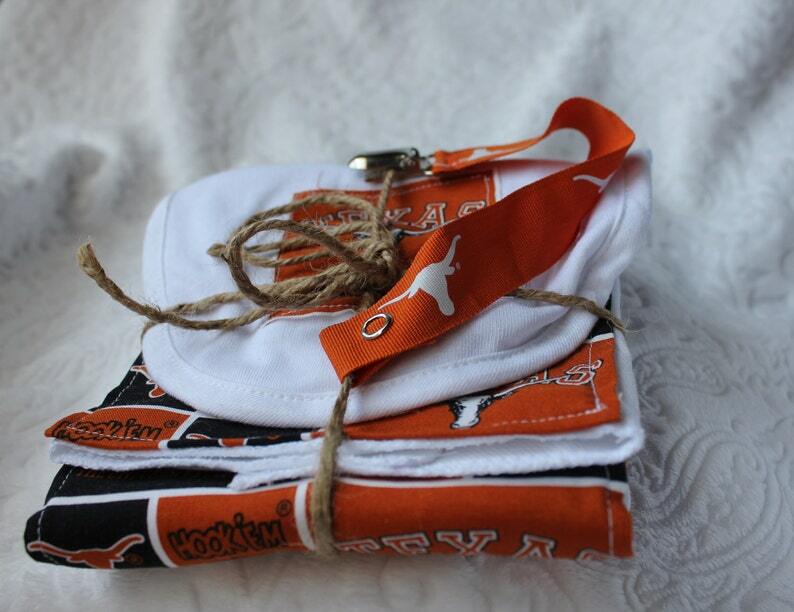 It has a pattern of burnt orange and black, Longhorn and University of Texas logos sewn down the middle. The matching bib is a white terry cloth bib with a velcro enclosure at the back of the neck for easy on and off. Clip the pacifier clip onto a bib or clothing and attach a pacifier or toy to the other end. It has a snap enclosure on the opposite end for easily attaching a pacifier or a link for attaching a toy. Ribbon is 7/8 an inch wide and is roughly 8 inches long. If you would like a different length, please let me know when you place your order.